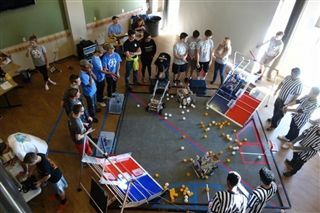 Twelve robotics teams from around San Diego gathered in Mullady Hall to compete in this year's challenge, FIRST Res-Q. As a result of their cumulative league points, Pacific Ridge team 4262 Ridgebots qualified to attend the San Diego regional FTC championships. Team 9266 Pyrobots ended the season right on the "bubble" and could still earn an invitation to attend the championships to be held February 27th at Canyon Crest Academy. Thank you to the many volunteers who helped the event run smoothly!